Oregon workers' compensation or workman's compensation is provided by Oregon employers at no-cost to the Oregon employee. Work comp provides immediate medical benefits and, under certain conditions, wage loss compensation to Oregon employees who are injured while performing their normal job duties. Workers compensation eliminates the need for the Oregon employee to file a personal injury claim against their employer and helps all parties avoid a protracted legal battle to prove the employer's negligence caused the employee's workplace injuries. Oregon workman's compensation requires the employer to provide benefits without determining who was responsible for the work injury. Oregon workers' compensation is administered by the Workers Compensation Division of the Department of Consumer Business Services (DCBS). The DCBS is Oregon's largest regulatory agency and is responsible for monitoring Oregon state laws and rules and protecting consumers and workers throughout the state of Oregon. Many Oregon work comp claims can be handled without the need for legal counsel, but if you have been involved in a workplace accident and have severe or permanent work injuries, contact an Oregon employment lawyer. Oregon employers, unfortunately, may be more concerned with saving costs and closing your work comp claim than ensuring you have the type of medical care and wage loss compensation you need to recover from your Oregon work injury. 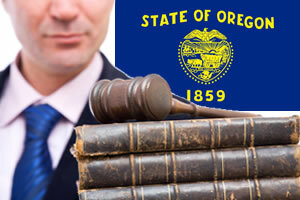 Oregon workman comp lawyers understand Oregon work comp laws. They can answer your questions and assist you at any stage of the Oregon workers' compensation process. Need legal help getting benefits for your Oregon workers compensation case? Simply complete our free form below to get started today! Oregon Work comp benefits may not be provided for work injuries which did not occur within the normal course of business or were the result of intentional actions meant to harm. Employees who fail to follow established safety guidelines or who are intoxicated at the time of their work injury may also have difficulty qualifying for benefits. If you have been denied Oregon workers' compensation, contact an Oregon work comp lawyer immediately. Oregon workers' comp insurance provides a variety of benefits to injured Oregon workers including: medical benefits, permanent partial disability benefits (PPD), permanent total disability benefits (PTD), temporary total disability benefits (TTD), vocational rehabilitation and death benefits to surviving beneficiaries. Medical benefits - Medical benefits are provided to Oregon workers who sustain a workplace injury. They are paid to the injured Oregon worker for the length of the disability and can include all medical care which is considered reasonable and necessary. Medical services which may be provided can include: doctor's visits, chiropractic care, oral surgery, laboratory services, prescribed medications, hospitalizations and nursing services. The Oregon worker may request their own treating doctor, unless they have been enrolled in a managed care organization. Treating physicians have the authority to authorize time off, light work duty, limited work hours and return to work policies. Oregon workers may have limited options to change doctors. Talk to your employer prior to seeking medical treatment to ensure your medical care will be covered by Oregon workers' compensation. Temporary Total Disability (TTD) Benefits - Temporary total disability (TTD) benefits are paid to Oregon employees who are unable to temporarily return to work due to an Oregon workplace injury. The first three days of lost work are not compensated unless the worker is hospitalized. Workers may be compensated for the first 3 days if they miss at least 14 days of employment. Temporary total disability benefits are paid at 66 2/3 of the worker's wage (subject to state's maximum and minimum allowable amounts). TTD benefits are paid until the worker is released to return to work by their treating physician, the worker is released to light duty or the worker has reached their maximum medical improvement level. Permanent Total Disability Benefits (PTD) - Permanent total disability benefits may be paid to workers who are unable to return to any type of employment after an Oregon workplace injury. PTD benefits entitle the worker to lifetime benefits. They are only paid after the worker has reached their maximum medical recovery level, but due to residual impairments, is unable to resume work. PTD benefits are calculated based on the severity and type of work injury. The worker's age, educational level, job experience and residual work capacity will be evaluated prior to awarding PTD benefits to determine if they are able to resume any type of employment. Permanent total disability benefits in Oregon may be paid until the worker reaches 65 years of age and is entitled to Social Security Disability benefits. Permanent Partial Disability Benefits (PPD) - Permanent partial disability benefits (PPD) may be paid to Oregon employees who are able to return to work but who have residual injuries or loss of body function resulting from their work injury. PPD benefits are paid if the worker cannot make as much money in their job as they could prior to their workplace injury. To calculate the PPD amount an Independent Medical Examination is performed and the worker's injury is rated. Ratings can range from 1 to 99%, but most workers will get a rating of 5 to 30%. The impairment value is then multiplied times the worker's weekly wage at the time of the injury (maximum and minimum amounts apply). Employees may request a second disability examination if they disagree with the initial evaluation. Vocational Rehabilitation Benefits - Vocational rehabilitation benefits are provided to Oregon workers who are unable to return to their previous job due to their workplace injury. Oregon workman's compensation provides a vocational rehabilitation counselor to the worker who will evaluate the injured worker's case and determine if they are eligible and if so, what services may be available. Vocational rehabilitation services can include: job search skills instruction, job development, return-to-work follow-up and labor market surveys. The goal of all vocational rehabilitation is to help the worker return to work. Death Benefits - Death benefits may be paid to the surviving spouse and children of the deceased worker. The spouse is entitled to 66 2/3% of the worker's average weekly wage. Each child may entitle the family to an additional 10%, up to the maximum allowed by the state. Spouses who choose to remarry will cease to receive benefits but they may be entitled to a lump sum payment equal to 3 years of workman's compensation. Children will be entitled to death benefits until they reach age 18, unless they are considered mentally or physically unable to support themselves.Death benefits may also include a burial allowance which is 10 times the deceased worker's average weekly wage.